Alley Cat Rescue, Inc., An Alliance for Cat Protection, announces their participation in the Saving Pets Challenge to raise money for trap-neuter-return in Los Angeles. For over 20 years, Alley Cat Rescue (ACR) has been at the forefront of advocating for community cats and promoting their humane management through trap-neuter-return (TNR). ACR has assisted more than 40,000 cats and kittens through their adoption, TNR and spay/neuter programs. Now ACR wants to target the city of Los Angeles where an estimated 2-3 million feral cats live. The city of Los Angeles is currently not allowed to implement or support TNR after a lawsuit by conservation groups. The city now needs to complete an environmental impact report on the effects of TNR as well as pass a new TNR program through the city council. In the meantime, it is up to groups like ACR to help the feral cats living on the streets. The Los Angeles Animal Services euthanizes more than 4,000 feral and unweaned kittens every year. TNR will help reduce these numbers by ending the cycle of reproduction and by moving healthy cats and kittens into adoption programs. In 2017, ACR TNR’ed 175 cats in Los Angeles and hopes to help even more cats this year. The money raised from the Saving Pets Challenge will be vital towards providing the resources needed to meet this goal. Mt. Rainer- Alley Cat Rescue finds adopter for rescued cat who was tortured and mutilated and increases their reward for information leading to an arrest and conviction of person responsible to $3,500. In January 2018, Alley Cat Rescue saved a tortured and mutilated cat who faced an uncertain fate at a local shelter. The cat had his ears cut and limbs and tail bound by an unknown animal abuser. He was quickly named Hardy after his courageous personality and ability to overcome hardships. After weeks of monitoring and care by Alley Cat Rescue, Hardy got a second chance at a happily ever after when he was adopted at the end of February. Alley Cat Rescue will continue to focus on Hardy’s case and is offering a $3,500 reward for information that leads to the arrest and conviction of the person or person(s) responsible. “Animal cruelty can be indicative of a violent personality. A person who commits such violent acts against an innocent cat could progress to hurting more animals or even people,” Alley Cat Rescue Communications Associate Brianna Grant explains. The Prince George’s Police Department has recently opened up an investigation into Hardy’s case and is offering an award for information on this case. Anyone with any information on Hardy’s case should contact the police department at 301-772-4911. If callers wish to remain anonymous they may call 1-866-411-8477. ​Mt, Rainer- On May 1, 2018 Alley Cat Rescue, An Alliance for Cat Protection, will be kicking off its annual May Spay Challenge and calls on veterinarians to provide free or low-cost sterilization for feral cats. Alley Cat Rescue is preparing for its annual May Spay Challenge, a month-long international initiative to save lives and promote the spaying and neutering of feral cats. Alley Cat Rescue calls on veterinarians to help “fix” the kitten invasion by pledging to spay or neuter at least one feral cat each week for the month of May. Veterinarians are encouraged to work in collaboration with local animal rescuers to identify and assist cats in need of sterilization. By performing trap-neuter-return (TNR), veterinarians are proactively addressing the issue of cat overpopulation before kittens are born to face uncertain outcomes at overcrowded shelters. Spring is notoriously referred to as “kitten season” because spring marks the high influx of kittens brought into shelters. This intake follows the cats’ breeding cycle beginning in March in the Western Hemisphere. Although kitten season may sound like a cute time of year, kittens are one of the most vulnerable groups of cats for euthanasia at shelters, and the high intake of kittens can decrease their chances of survival due to overcrowding. Over 3.2 million cats enter U.S. shelters each year, and sadly 3 in 10 of these animals will be euthanized. The number of cats being euthanized in this country is decreasing, and Alley Cat Rescue hopes this trend can continue with the help of cat sterilization programs, especially for cats living outdoors. Many of these kittens are born from unsterilized, free-roaming cats. Spay/neuter surgery is vital towards saving kittens’ lives and helping overburdened shelters. Alley Cat Rescue President and Founder Louise Holton says, “Our success in reducing outdoor cat populations is supported by those veterinarians willing to give back to the community by offering low-cost services for feral cats. Rescuers mostly use their own funds to neuter outdoor cats. They cannot do it alone. TNR stops the breeding cycle more efficiently than catch-and-kill and is used by groups all across the world." Alley Cat Rescue first launched this initiative in May 2010 and since then over 1,200 veterinary hospitals from 45 U.S. states, Canada, Israel, Croatia, and South Africa have spayed and neutered over 30,000 feral cats. Alley Cat Rescue hopes even more veterinarians will get involved this year. Any veterinarians interested in registering for the May Spay Challenge can register here. ​Mt. Rainier, MD— A young cat was brought to Prince George’s County Animal Shelter with an array of wounds to his ears, limbs and tail that left him limping and weak. His ears were gashed open and his toes were hanging on by threads. It was clear that this poor cat had been through extreme cruelty. Because of the severity of his injuries and necessary treatment, we came in to rescue this traumatized cat. It was immediately clear that these injuries were the result of intentional animal cruelty. Our veterinarian assessed him and his prognosis was worse than we could have anticipated. She examined the wounds and estimated the cat had been tortured over a period of three weeks. This 8 month old cat had slowly suffered with no veterinary care or compassion. The abuser had tied his tail and limbs tightly and had cut his ears. His tail and two of his toes required surgical removal. We were humbled by his ability to trust and interact with us after he had gone through so much. He started out as an unknown victim of animal cruelty but has now become Hardy, ACR’s affectionate and trusting little boy. The name Hardy means courageous and able to overcome difficult circumstances. This only begins to describe Hardy’s resilient personality. Right now Hardy is receiving love and compassion for likely the first time in his life. He is recovering and is undergoing continued veterinary care. People interested in following his story can keep up to date on our Facebook page: https://www.facebook.com/alleycatrescueinc/. Alley Cat Rescue is offering a $2,500 reward for information that leads to the arrest and conviction of the person or persons responsible for the abuse. If you know anything about Hardy’s case please contact Prince George’s County Animal Control at 301-780-7200. Mt. Rainier, MD-- Alley Cat Rescue traveled down to Houston, Texas after Hurricane Harvey hit the area to help with rescue efforts. Shelters in the area were in desperate need of help and ACR was there to assist. ACR rescued 40 cats that were in local shelters to free up space for cats displaced by the hurricane, donated supplies to the shelters and sorted through mountains of donated supplies. ACR was also involved in on-the-ground rescues. A team paddle-boarded through the devastation to rescue people and pets left behind. Although this situation was tragic, the team met many inspirational people and animals. In total, 17 cats were brought back to ACR headquarters in Brentwood, Maryland while others were brought to the Los Angeles office. The cats were named after towns in Texas such as Austin, Amarillo and Idalou. The work didn’t end when the team returned to Maryland though. Some of the cats needed extra care, such as Amarillo, who staff members nursed back to health. He went from a weak kitten to an outgoing and rambunctious personality. Since then, all but one Harvey cat have been adopted. Autumn is still looking for a home and would love to be adopted in time for the holidays! Autumn is ACR’s feisty and adventurous tortie girl. She loves to play but will come up for pets when she is tired and wants some love. If you are interested in adopting Autumn fill out on online inquiry form. Mt. Rainier, MD—On October 13, 2017 Alley Cat Rescue, An Alliance for Cat Protection, released a petition demanding an end to community cat bounty hunting in Banana Shire, Queensland. The government of Banana Shire has recently announced a bounty for the scalps of dead community cats. Alley Cat Rescue vehemently opposes encouraging individuals to kill community cats and is working to reverse this inhumane and ineffective bounty. Our petition has reached over 105,000 signatures and counting. Almost 11,000 of these signatures are from Australians themselves. Many Australians have commented that they support trap-neuter-return and concerned about the safety of their pet cat if the cat gets outside. Property owners need to give hunters permission to hunt on their property but cats do not understand property lines and can wander into a hunter’s territory. HOW TO SAVE COMMUNITY CATS─In her new book, Alley Cat Rescue's Guide to Managing Community Cats, Louise Holton shares her extensive experience running Trap-Neuter-Return (TNR) programs and explains why it is essential to move away from the current system of catch-and-kill. Holton combines her wealth of practical knowledge with supporting scientific research to illustrate the effectiveness of TNR, while also dispelling the rampant myths surrounding feral cats. Louise Holton has been at the forefront of humanely managing outdoor cat populations for more than 40 years. "TNR is a true life-saver for outdoor cats because it stops the breeding cycle and provides cats with vaccines and a support system that improves their health." says Holton. "TNR programs greatly reduce the strain on limited shelter resources and free up valuable space so that more animals can be saved." Chief Executive of International Cat Care Claire Bessant says, "The benefits to cats and to the human community if cat populations are managed humanely, and stable colonies are formed rather than eradicated, are now well documented. In this new book, Louise reiterates this principle from her own experiences." Holton believes the research and data presented in her book will shed new light on hot button issues regarding TNR, as well as clear up misconceptions that people have about community cats. Holton began helping feral cats during the mid-1970s, when she worked with the Johannesburg SPCA to TNR feral cats at her work place. Upon moving to the U.S years later, Holton dedicated her life's work to advocating for TNR programs and humane management for community cats, after learning that catch-and-kill was the standard method for controlling outdoor cats. New York Times bestselling author Elizabeth Marshall Thomas says, "[This is] the best and most informative book ever written on the subject and we badly need the information. The research is thorough, the science is flawless, the information is fascinating and the writing is beautiful." 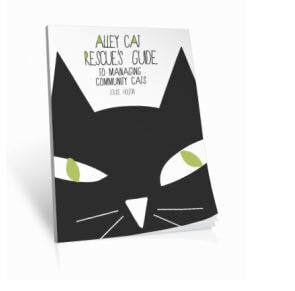 Alley Cat Rescue's Guide to Managing Community Cats is now available on Amazon and directly through ACR's website. Louise Holton has founded two international cat advocacy organizations and has helped pioneer Trap-Neuter- Return (TNR) in the U.S. Over the past four decades, she has assisted more than 40,000 cats, presented at numerous conferences and symposiums, and won several awards, including a Muse Medallion from the Cat Writers’ Association for her informational booklet, Feral Cat Colony Management and Control: Facts and Myths about Feral Cats.